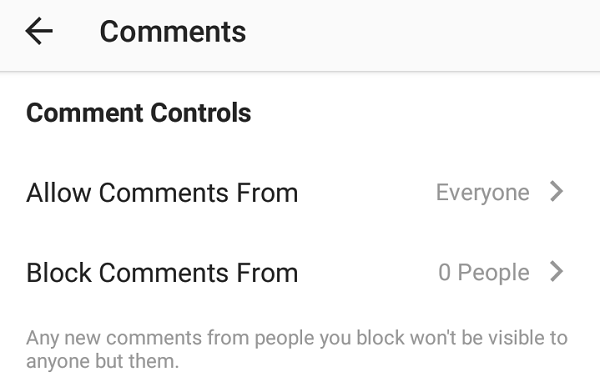 If you have a public profile on Instagram, you can now control who can post comments on your posts and even block people from commenting. Have you been in a situation where you share pictures on Instagram and there are some people who always post irrelevant comments? Earlier, you can disable comments entirely for a post. But now Instagram offers more control over who can post comments on your posts if you have a public profile. Go to your profile and tap the three dots (Android) or gear icon (iOS) in the top-right. Tap Comments under SETTINGS from the list of Options. From there, you can choose who can comment on your posts by tapping Allow Comments From. Select one of the four options—Everyone, People You Follow and Your Followers, People you Follow or Your Followers. You can also individually block comments by tapping Block Comments From and select the people by searching them. You can control who can comment on your posts on Instagram. In addition to the above-mentioned ways, you can also further safeguard your account by turning on the filter to block offensive comments. To do so, under the Comment Controls section, turn on Hide Offensive Comments option under Automatic Filter. Or you can manually enter specific words and phrases separated by commas you want to hide under Manual Filter. So, from next time instead of turning off comments entirely for a post, try these methods and happily use Instagram!